Birthdays and a Book Giveaway! 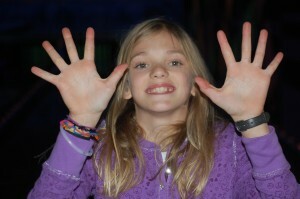 This year, Andie needs 10 fingers and a toe! In all the excitement around my daughter’s 11th birthday, I overlooked another birthday of sorts! I can hardly believe it, but I’ve been at it for 1 year now! My 1st entry announcing Andie’s 10th b’day! And thank you, thank you, thank you wonderful readers! I ventured into this world afraid and uncertain. But as you shared your own personal stories, memories, advice and thoughtful comments, I quickly discovered the pure joy of sharing my weekly musings with an online community! 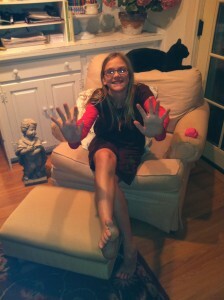 My 1st entry announcing Andie’s 10th b’day! I’ve decided as a thank you celebration to try something I’ve never done before. No, not mine. That is still in process with an update coming soon. Instead, I’m looking to give away a book that had a huge impact on my life. It’s a book about worthiness and boundries and love and shame and so much more! It’s called The Gifts of Imperfection: Let Go of Who You Think You’re Supposed to Be and Embrace Who You Are. 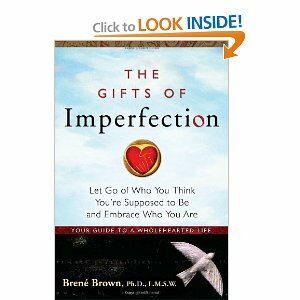 The author, Brene Brown (please put a little thingy over the last e in Brene because my computer won’t), calls it a guide to wholehearted living. I can’t say enough about this book. Nearly every line of my copy is underlined and almost every corner of every page is turned down! I wanted everyone in my family to read it and ordered 5 copies. When the rather large box arrived, I was a bit surprised. When I opened the cardboard box and found 12 copies, I was even more surprised. When my husband and daughter theorized that I must have started with one, decided to order 2, and accidentally created 12, I just nodded. Mentioning that I’d actually ordered 5 would have simply confused the situation, right? Well, if you’ve been reading my posts for a while, you know I’m a big believer in the guidance of higher powers. So rather than try to make meaning out of this considerable order, I figured I’m supposed to give the book to 12 people who need it! So far, I’ve come across 11. I’ll post a few of my favorite passages from the book and let you decide! If so, simply leave a comment and tell me what you liked, how it moved you or even the title of a book you’d like to recommend! I will draw a name at random after midnight on Saturday, December 10th, using the tool at www.random.org and notify the winner by email. What I love so much about the book is how Brene shares her own personal stories. “I always been prone to worry and anxiety, but after I became a mother, negotiating joy, gratitude, and scarcity felt like a full-time job. For years, my fear of something terrible happening to my children actually prevented me from fully embracing joy and gratitude. Every time I came too close to softening into sheer joyfulness about my children and how much I love them, I’d picture something terrible happening: I’d picture losing everything in a flash.” Me, too! I’d written next to that passage. It was so hard to pick just a few out of all the wonderful passages, but here’s one more. What do you think? I can’t wait to hear! http://kaseymathews.com/wp-content/uploads/2019/02/Kasey-mathewsNewLogo2019.jpg 0 0 Kasey Mathews http://kaseymathews.com/wp-content/uploads/2019/02/Kasey-mathewsNewLogo2019.jpg Kasey Mathews2011-12-01 13:22:592016-08-30 13:31:01Birthdays and a Book Giveaway!